Chinese New Year falls on 5th February and welcomes the year of the pig. 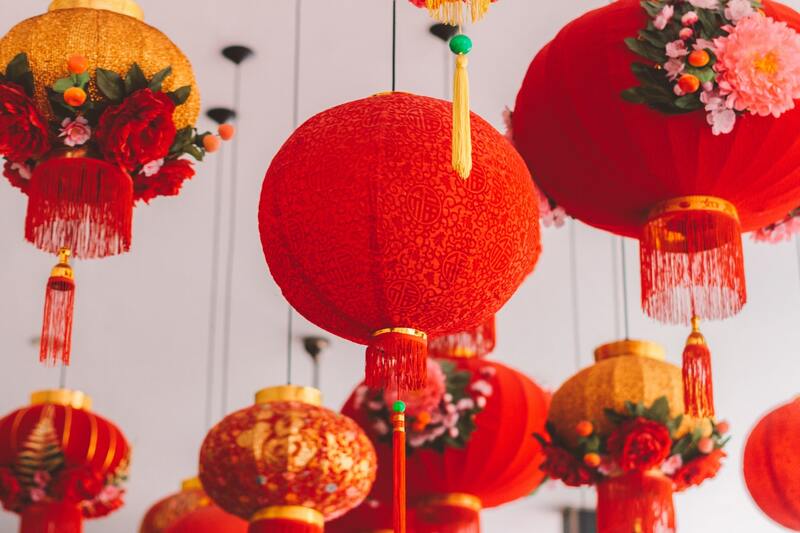 If you celebrate Chinese New Year or would like to get in the spirit, we’ve got some tips on how to decorate your home for the occasion. Chinese red lanterns are commonly seen in streets, offices and doors of houses with the belief that they drive off bad luck. Black Chinese calligraphy brushed on red paper are often hung on either side of door frames expressing good wishes for the coming year. These are usually done in pairs (couplets) because even numbers are identified with good luck and auspiciousness in Chinese culture. These impressive red paper cuttings are symbolic of luck and happiness and are often seen on doors and windows. Each animal or plant that is cut out represents a different New Year’s wish. These are a symbol of New Year’s greetings and are hung on doors and walls and look stunning. Customarily, they will feature figures and plants, legendary in Chinese culture. These are fairly similar to Chunlian and are large red diamonds with black Chinese characters. These are placed upside-down over doors to represent good fortune (Fu) pouring down on anyone who passes through the doorway. In Cantonese, Mandarin oranges are known as kam, which translates as gold, and so is auspicious in its name. In Mandarin, the name is juzi, sounding similar to their word for luck (ji). Therefore, these welcome a year of growing wealth and prosperity. The Chinese New Year is also known as the Spring Festival and so people often decorate their house with blooming flowers to represent wishes for a prosperous new year. Plum blossoms, orchids, peonies, and peach blossoms are the most popular of these plants. At Seymours, our friendly team of property professionals are on hand to help you with any of your property requirements. Contact us or visit one of our local branches.